If like many, you find yourself with a huge stock of microfiche with nowhere to go, there are only really a few options to be able to view them and beyond. One of those options is to purchase a microfiche reader but is it a reliable solution? Whilst there are other options out there this is normally the first option that comes to mind for most people and start searching for a device that they don't know a great deal about and, more often not, the specs of a microfiche reader can be complex at best; they are simply not made for the amateur. But for the sake of this review we're going to be reviewing one of the budget models that does what it says on the tin in allowing you to view your microfiche. 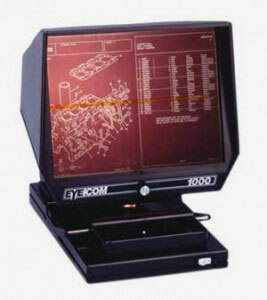 The device is the Eye Com 1000 Reader which typical sells for around £300-500. This is one of the lower end readers and one that, if desired, most could afford. It would seem pointless to review one of the larger devices such as the Microvue XL16 O S which comes in at around £2000 as those are strictly for those who have experience with the devices. So the Eye Com 1000 Reader comes in at a relatively compact 14″ high and 13″ wide which makes it nicely compact compared to its forefathers and it also comes with a generous 9″ screen which is decent enough for the price to be able to see the contents of the microfiche. It's not huge but perhaps it's just what the majority of people need. It also comes in at weighing around 10lbs so it's also relatively easy to move around too if required. It also offers excellent magnification of up to 75% of the original size of COM (computer output microfiche) and standard fiche, which is quite impressive for its size and dimensions. Overall the Eye Com 1000 Reader is ideal if all you need to do is view your microfiche but it has the same problems that all microfiche readers do; it is extremely limited. Compared to modern and more flexible options such as microfiche scanning by outsourcing, they only allow you to view the contents of the microfiche. Equivalents such as microfiche scanning allow you to view the microfiche from the comfort of your own computer with any size screen that you wish and allows you to do almost anything that you could with any other type of digital document; print, share online, email and even edit them and in some cases if the contents of the microfiche has text you can have them converted with OCR so that the text is searchable on your computer if you so wish, which is particularly handy if you're going to be searching for particular references and names (the quality of this can entirely depend on the quality of the microfiche, so keep this in mind). And of course the price of the service compared to the reader is also a major sticking point but with companies offering microfiche conversion from as little as 70p per sleeve and 3p per image, for relatively small quantities of microfiche in the low to mid thousands of images, then price-wise scanning still blows the reader out of the water. Right now the world of microfiche viewing is at a transition period; the machines are less desirable so their prices go up because they have become niche products whilst superior services prices drop due to improving technology in their area, ironic as it's changing technology that has killed the microfiche in the first place. If you simply want to view microfiche, then a budget viewer like the Eye Com 1000 might be the right way to go for you, but when you could get so much more from the images on the microfiche, why would you? What Size Images Are Stored on Microfiche?